Heading north from the summit, the LT drops down to Camel's Hump Hut Clearing (10.2 mi.). This was the site over a century ago of a rustic frame hotel (summit house), which failed financially and finally burned down in 1875. The clearing was later adopted by the Camel's Hump Club of Waterbury as a location for three tin huts that provided shel­ter for hikers from 1912 until the early 1950s. West from the clearing the Burrows Trail (6) descends 2.1 mi. to a road leading to Huntington Center. To the east the Forestry Trail (7) leads 3.1 mi. to the parking area at the Couching Lion Farm site. Beyond the clearing, the Long Trail enters the woods and descends steeply to a junction (10.6 mi.). To the right is the rugged Bamforth Ridge Trail (8), which descends 5.2 mi. to River Rd. between Jonesville and Waterbury. Bearing left on the LT it is 100 ft. to Gorham Lodge. 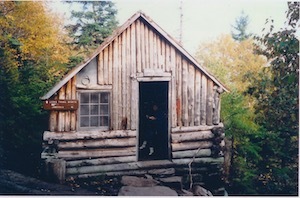 Gorham Lodge, a log cabin with bunks for 12, was built in 1950 by the Long Trail Patrol in memory of H. W. Gorham, with funding from the New York Section. 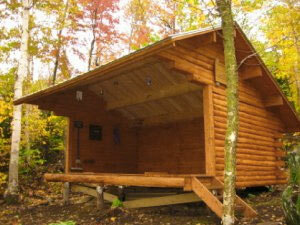 The lodge was extensively rebuilt in 1981 by the patrol and GMC volunteers. A brook to the east provides water, and a GMC caretaker is in seasonal residence to educate and assist hikers and maintain the site and nearby trails. A small fee is charged for overnight use. 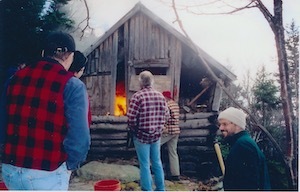 Wood fires are prohibited at Gorham Lodge. Montclair Glen Lodge to Gorham Lodge, 2.6 mi. 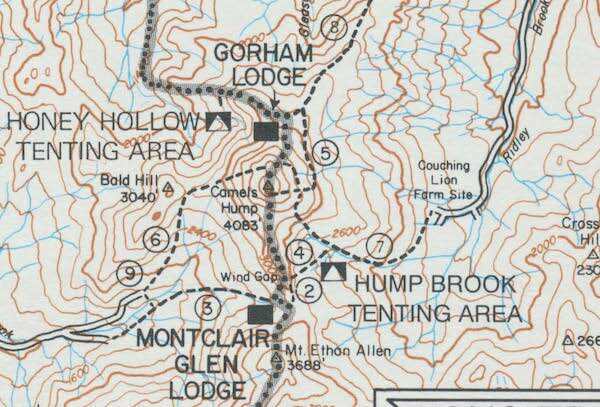 The 2001 Summer edition of Long Trail News reported "Gorham Lodge, on the north flank of Camel's Hump, has been closed. 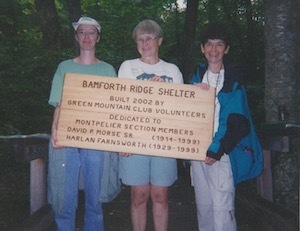 While still standing, the fifty-one-year-old shelter is about to fall off its foundation and is unsafe for use." Nov 19 -- Phone conversation - how do we start? Jun 26 -- Julia Heller sends "thank you"
Sept 21 -- The work plan, revised and muchly "done"